The moment I laid eyes on Andy Mackie, I fell in love. I fell in love with an intoxicating laughter, a mesmerizing gaze and a gentle soul. As soon as he said, "Hello, you must be the lady from Seattle..." I immediately realized that I was in the presence of perhaps the most amazing person on the planet. A former livestock manager, horse trainer and founder of his own music foundation, Andy Mackie lived a long and fruitful life. Born into a poverty-stricken family, he learned at a young age that in the end, only three things mattered -- love, family and music. 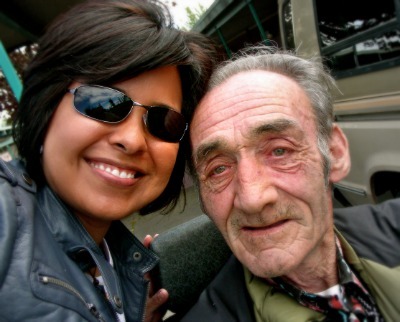 Every wrinkle on his face told a story of the long journey from Ellon, Scotland to Chimacum, Washington. Stories of overcoming all sorts of adversity, including the loss of a sister, wife, 10 heart surgeries, a horse accident, paralysis and so on. Already at death's door he embodied strength, stoicism and perseverance. Andy was a subject for my mini-documentary video series called, "Why Music?" back in 2009. The series highlighted local musicians impacting the lives of people and serving their community through music. In the short time I spent with him, I learned more about adventure than all of my world travels combined. I learned that you needn't go far to experience life's grandeur and that a person can live simply and be truly content and at peace. I learned that love, when given away freely and unselfishly, is the best gift you can bestow anyone, and it's also the best gift you can receive. He believed everyone could learn to sing or play an instrument and that we're all happier people because of it. Not only did he foster a love for music in each and every child he encountered, he taught them how to make instruments too. And if that wasn't enough, his foundation supplied instruments to youth and even funded college music scholarships. A compassionate individual with a heart for service, his dedication earned the love and respect of an entire community. I was consumed with sadness upon learning of his death back in 2011. I knew he had moved back to Michigan to live with his daughter the year before. Despite his illness progressing rapidly, he continued teaching music to his grandchildren up until his last breath. Are you surprised? I was unable to attend his memorial, but I heard it was a beautiful celebration. His music foundation continues to thrive both here in Washington and in Michigan. I'd like to think that he's celebrating somewhere in the celestial skies playing heaven's harmonica and teaching the angels some good ol' folk music. I miss you, Andy. I hope you'll enjoy this new version of the original "Why Music?" interview with Andy Mackie. Be inspired. Why Music? -- A Tribute To Andy Mackie from Carla Moreno on Vimeo.